The Johns Hopkins University School of Nursing occupies three buildings on the East Baltimore campus—the Pinkard Building, and Student and School of Nursing Houses. The project site is located on a half city block directly across the street from the main entrance to Johns Hopkins Hospital. Designed and built in the early 1990’s, the Pinkard Building is a five-story facility that serves as the central learning and work space for School of Nursing students and faculty. The building was designed for a significantly smaller student population and at a time when the school offered undergraduate education. The smaller, residential-scale Student and School of Nursing Houses provide student study and lounge space, and house administrative offices, respectively. Hord Coplan Macht is providing programming and planning/design services for the School of Nursing. The school is transitioning from an undergraduate program to a graduate and PhD nursing program. The goal is to explore innovative space planning to maximize space utilization, improve learning and research, accommodate expanded central student services, minimize long term operating and maintenance expenses and increase overall efficiency within the school. The project also included a complete facilities assessment for all three of the school’s buildings to document the existing conditions of the buildings and systems and project short and long term deferred maintenance expenses. 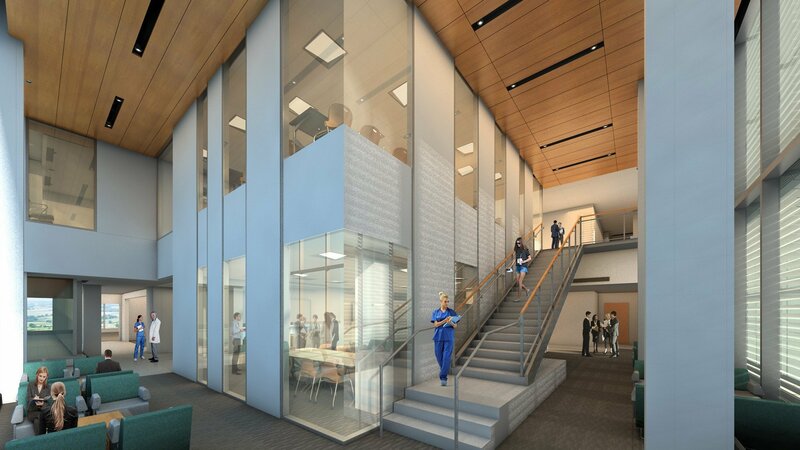 Through integrated planning, the team combined quantitative and qualitative hands-on analyses to develop a new program of space and explored the desired student experiences with the School of Nursing. 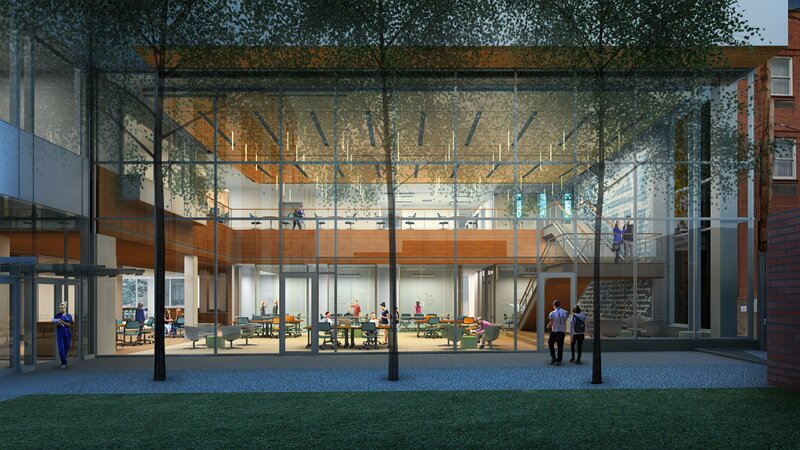 The result of the effort produced a design that will be student-centric, more compatible with the pedagogy, and will increase the efficiency of the building and operations. The project includes the demolition of the School of Nursing House and, in its place, the construction a 42,000 sf addition. 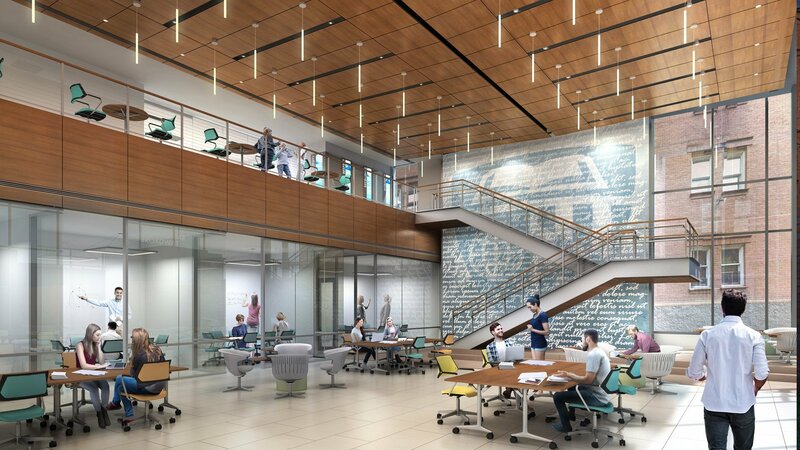 New program spaces include open and enclosed study space for students, a café, reimagined administrative and faculty spaces to encourage cross-institutional collaboration, an expanded conference and event space, new centers for research and new, technology-rich learning spaces. 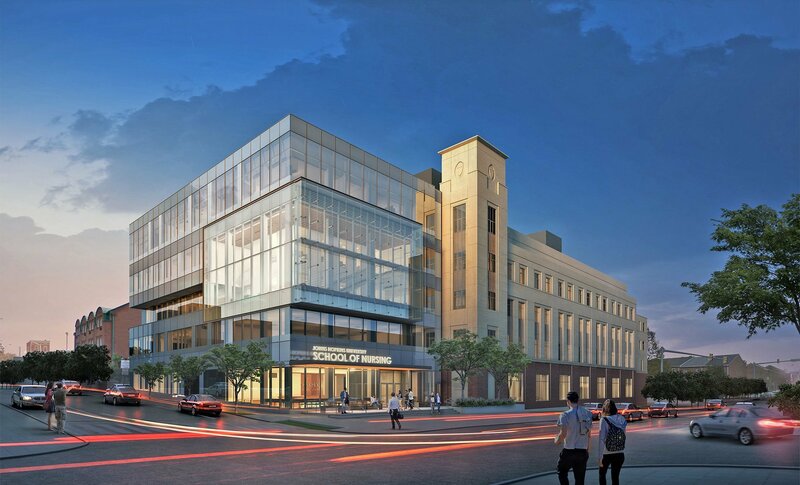 The north end of the Pinkard Building will be renovated and clad in a more transparent skin to allow the building to enliven the street and create a welcoming learning environment.